Situated in Everett Washington and designed by the "City of Everett Public Facilities District", Comcast Arena at Everett is a huge multi-purpose complex. The arena has been operating since September 2003 and has a net worth of 83.3 million dollars. It has a capacity of 10,000 seats and has hosted many concerts and various other performances. Some famous events that have taken place at the Comcast Arena include the "Ringing Brothers Circus", "Disney on Ice", "Sesame Street Live" and many more. With Comcast Arena at Everett tickets you can certainly be part of a spectacular show you won't forget. The Comcast Arena at Everett initially started off as the host of the "2008 Skate America" which was a three-day championship for some of the best skaters in the world. All the programs were covered on the channel NBC. With the capacity to accommodate large number of people and excellent facilities provided, the event turned out to be the biggest show in Skate America's history. Comcast Arena at Everett has also collaborated with various restaurants and hotels to maximize the experience of their guests. These include, Holiday Inn Hotel, Best Western Hotel, Marriot Hotel, Subway, Mazatlan Restaurant and Whidbey Coffee. In addition to these, there are also Concession Stands, a sit down restaurant called The Arena Grill, The Ice Box Lounge and multiple party areas. The Comcast Arena at Everett has been used for many sports events including hockey, indoor football and Lacrosse. It is home to the Everett Silvertips which is a "Western Hockey League" team. The arena has hosted many sport related events including the "Washington Stealth" of the "National Lacrosse League", "International Basketball League's Everett Explosion" and many more. Not only this, the arena also has a separate ice rink and a place for indoor football that started in 2012 with the "Everett Raptors" for the "Indoor Football League". Furthermore the staff at the Comcast Arena at Everett has been trained in an excellent way to assist customers. For instance, they have specially trained staff to cater to all kinds of guest inquiries, ticket issues, lost-and-found articles and security issues. Not only this, it also provides patrons for people with disabilities, which include wheelchairs and other assisting devices. For the benefit of the customers, it also has a "Guest Services Center" which is open in all events. Some of the upcoming shows taking place at the arena include the "Block Party in Celebration of 10th Anniversary" and "Ringling Bros and Barnum & Bailey". To attend an event at the venue, get Comcast Arena at Everett tickets now. The average Comcast Arena At Everett Tickets price will cost you between $57 and $731, if you are looking for the cheapest seats then catch the event being held at the Angel of the Winds Arena, Everett on 18/05/2019. The average ticket will cost you the highest on 29/07/2019 at the Angel of the Winds Arena, Everett. Minimum get in price is for Comcast Arena At Everett Tickets is $21 for the event being held at the Angel of the Winds Arena, Everett on 25/05/2019 , there are some venues that have a much higher get in price, for instance the cheapest seats at the Angel of the Winds Arena, Everett on 29/07/2019 will set you back $206. When will my comcast tickets ticketmaster be delivered to me? Comcast Arena At Everett tickets will be delivered to you before the event takes place. What are the accepted forms of payment for cirque du soleil quidam everet tickets? Comcast Arena At Everett Tickets can be purchased via a master, visa or credit card. How can I get comcast arena ticket discount from TicketMaster? 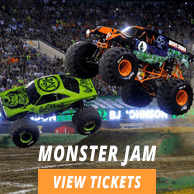 This site only deals with Comcast Arena at Everett TicketLuck tickets. Are there seat numbers on cirque du soleil quidam everett comcast arena tickets? Comcast Arena At Everett Tickets do not have seat numbers on them.